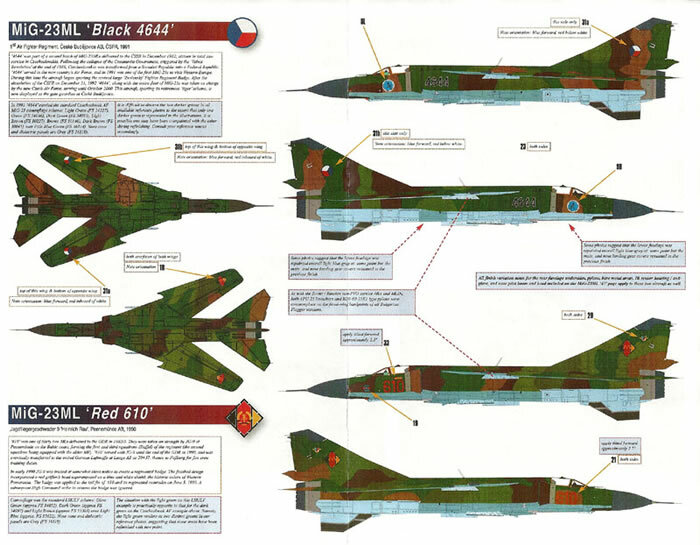 A wide range of alternative schemes to dress up the recent Trumpeter MiG-23 kits. The MiG-23 was a futuristic rocket ship of a fighter that saw both combat in Afghanistan and service opposite NATO in Central Europe. Given the longevity of service and number of users it is not surprising to find many options to get away from the clichéd kit decals and produce a unique model. 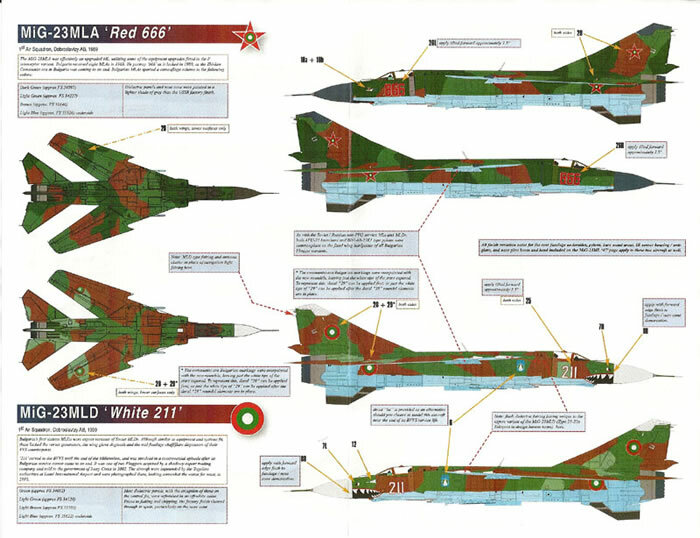 Every new kit of a Soviet or Russian subject that hits the market seems to elicit a response from Linden Hill and the Trumpeter 1/32 MiG-23 family that entered the market in the last 12 months or so has again had this outcome, in the same way the earlier Su-27/Su-30 family resulted in an ongoing series of out of the ordinary options for the modeler looking for more than the bland kit options provide. 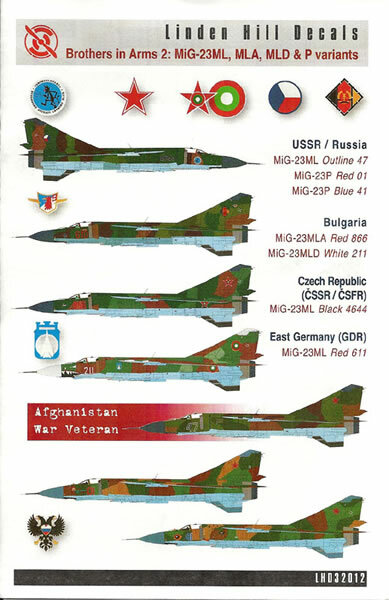 This sheet covers the MiG-23ML family and ranges from VVS multi-role units in Afghanistan to PVO interceptors as well as central European air forces in both WARPAC and NATO timeframes. 1 x MiG-23ML(A?) “47” Khandahar AB Afghanistan 1986/7. This is the most exciting subject to my mind, having a combat history and mission markings. 2 x MiG-23P from PVO Regiments in the Moscow Air Defense Region, including one Guards Regiment. 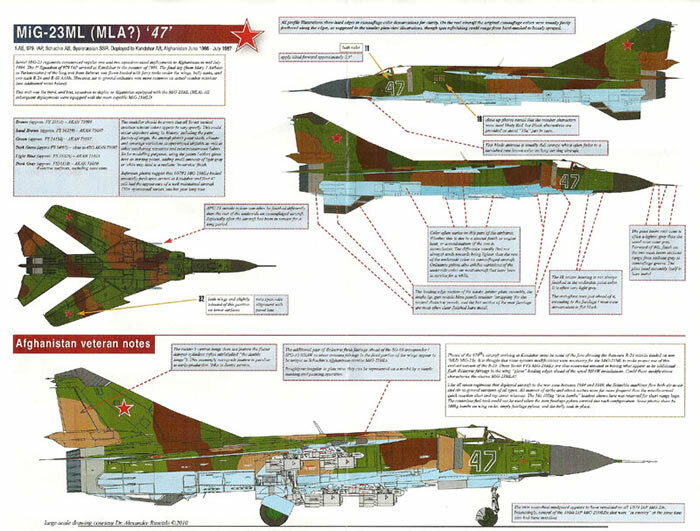 Given its interceptor role the MiG-23P had a number of airframe modifications from the ML, which Linden Hill document to allow an accurate model. All the subject aircraft wear disruptive schemes of greens and browns over pale blue and whilst appearing to be similar actually range from two greens and one brown shade over the blue to up to three greens and two browns so no two airframes depicted are identical. All subjects are well documented with three view drawings, scrap views and reference photographs in the accompanying instructions. 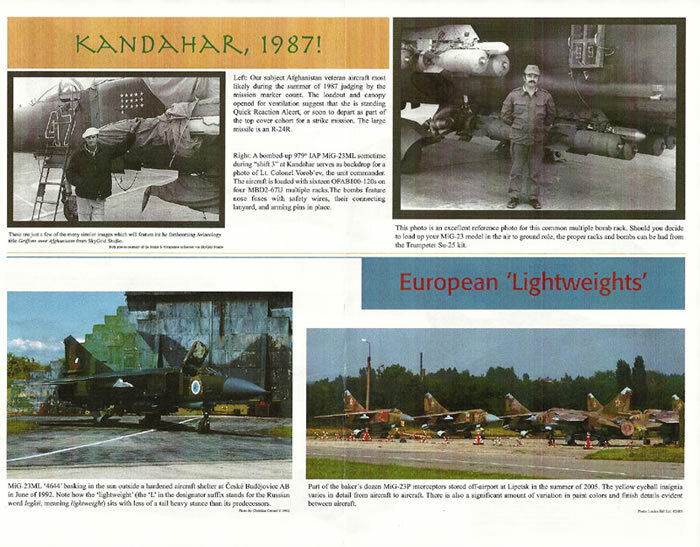 Of particular note are what must be very rare reference photos for MiG-23ML 47 of 979th IAP in Afghanistan showing the common warloads and mission markings. The instructions are spread over 6 A4 full colour pages and there is little more needed for someone wanting to model one of the options. It is not clear who prints Linden Hill’s decal sheets but in my experience they perform well with little difficultly and respond well to common setting solutions. 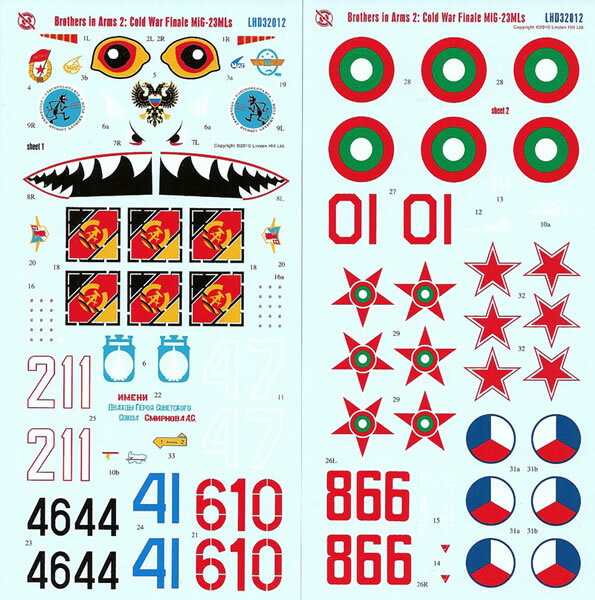 The Trumpeter 1/32 MiG-23ML is a nice kit overall but contains some relatively clichéd markings options. 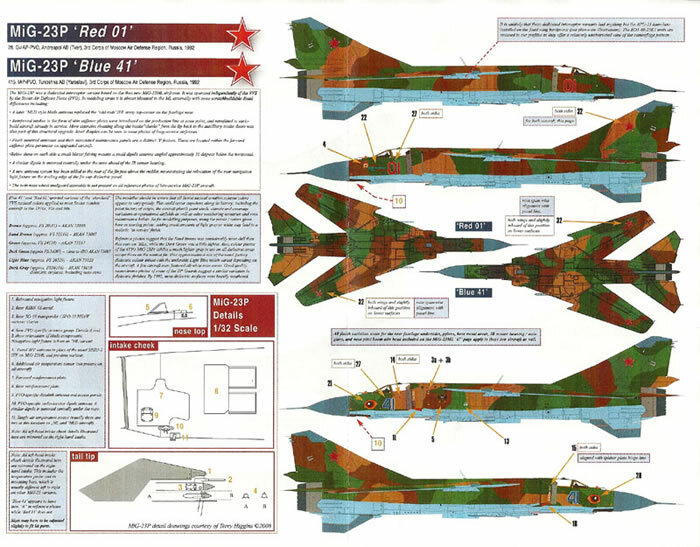 If the modeler wants to make a replica of a different jet or one with a combat history then this sheet from Linden Hill is definitely the way to go.